It’s ICYMI for October 27th. And we’ll tell you, we’re almost missing things with the crazy amount of product we have coming in for the holidays. But we pulled it together and we’re still giving you a look back on our weekly product received, upcoming events, and more! What happens when an architecturally trained group of friends with the shared love of travel come together? They create Point Two Design Group and make unbelievably beautiful city maps and state art like the ones pictured above. Look at those colors. 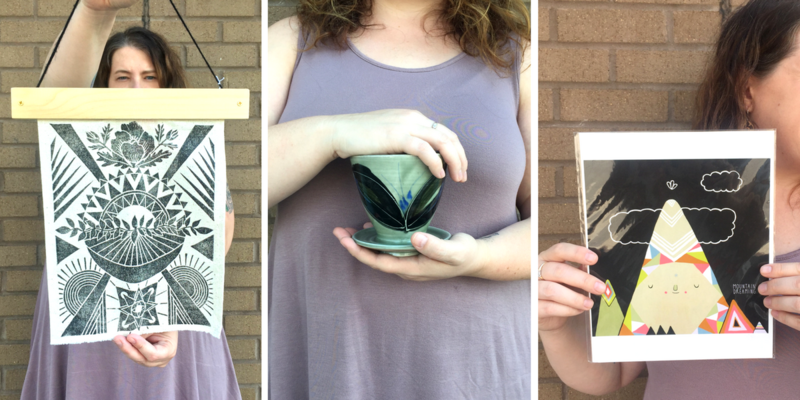 We’re so thrilled to have these variations now available in our Indy print collection. Now that we’re really approaching holiday and the temperatures are really dropping, you’ll be needing more things to do inside. -Or your crafty friends will. 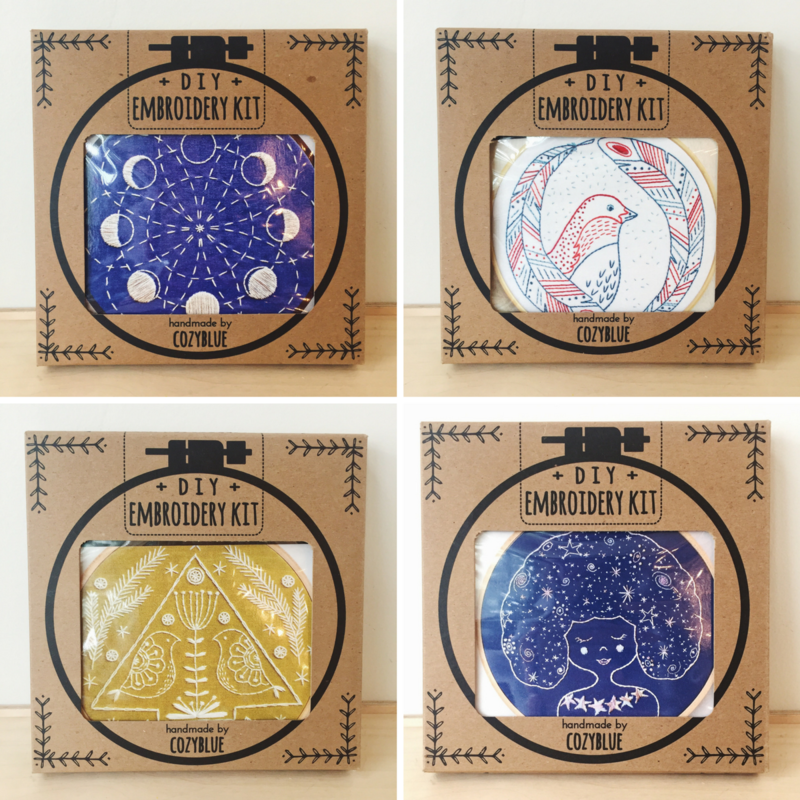 May I suggest new DIY embroidery kits from Cozy Blue? We have more than this in store, but I’m real partial to that galaxy/moon phase one. Space is all the rage. Your Favorite Magnets are Back! Hey Arthur’s Plaid Pants, we’ve missed you! 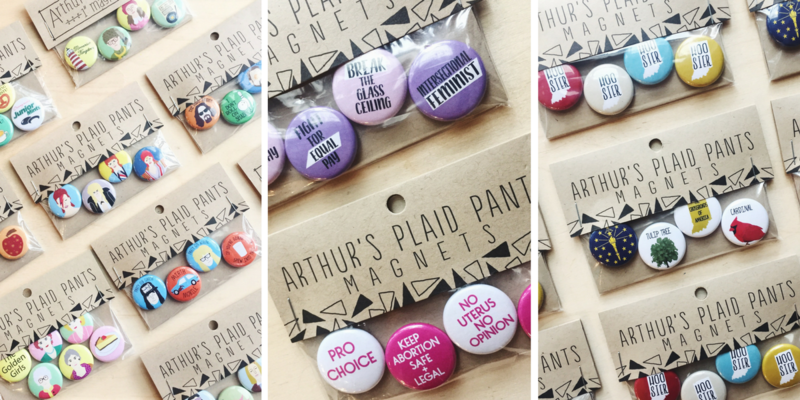 Find Bowie, Golden Girls, Twin Peaks, and more pop-culture inspired magnets along with some lady power, and Indiana themed button magnets in store. Keep that fridge cool. Made in Roanoke, IN, 100% of the proceeds from the sales of Best Boy’s products go back to charities that support families and children. I can say I have tried every. single. sauce. And they are all amazing. 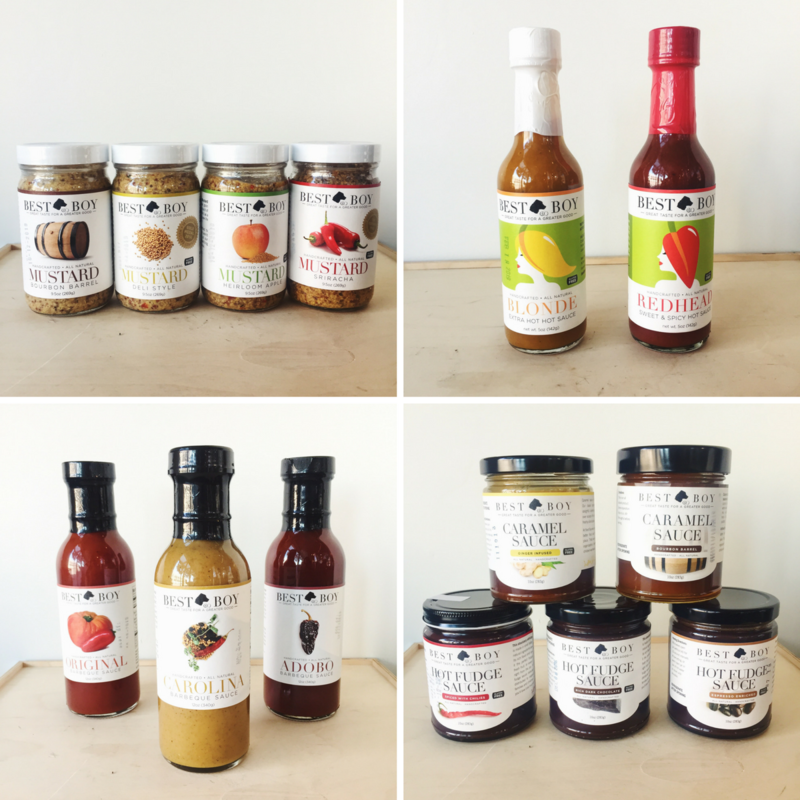 I suggest adding a couple of these to your foodie friend’s Christmas gift, or throw it in Dad’s stocking. It’s food that tastes good and does good. 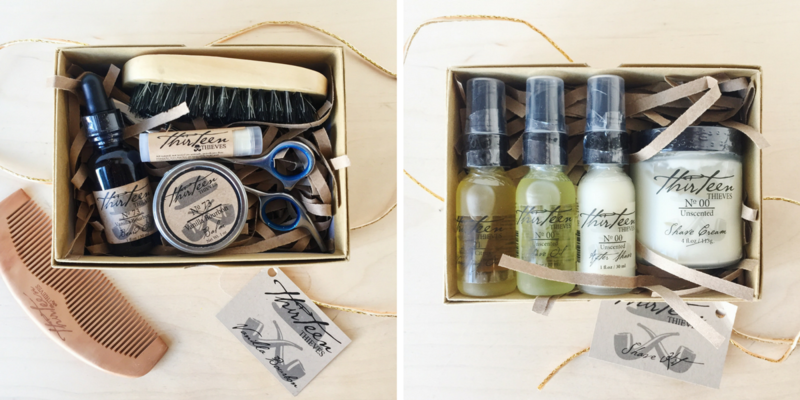 Shave kits and beard care kits from new vendor, Thirteen Thieves, make a great, already-put-together gift. Included in the beard kit are clippers, beard oil, mustache wax, comb, and beard brush. For the shave kit, you’ll find shave cream, aftershave, shaving oil, and nourishing oil. So, whether or not dad keeps those whiskers trim or has the beard of Zeus, we’ve got you covered. They’re pretty much two of my most favorite things. 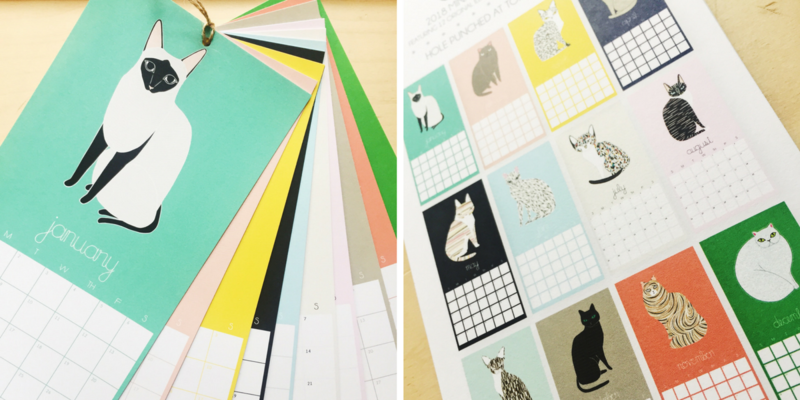 And you can’t have too many cat calendars in your life. New beautifully illustrated kitties for each month can be found in the newly released calendar from Gingiber. Congratulations on your “Nice, Nice, Baby…” -If that song is now stuck in your head, you’re welcome. 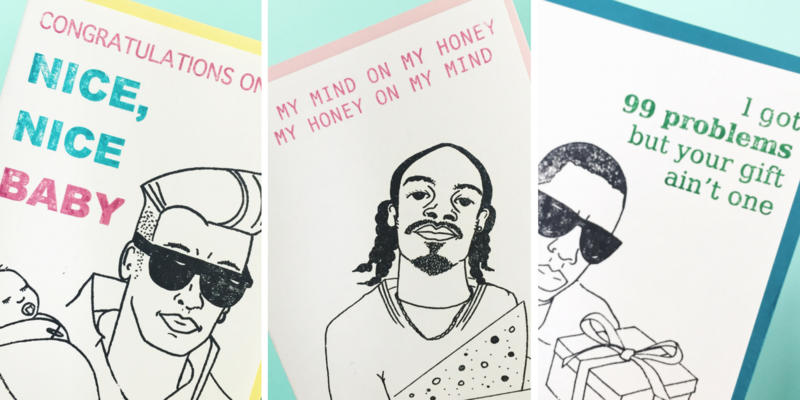 The ever-popular hip-hop cards from Paper Michelle are back! …is straight up crazy right now. So much so that we’ve called in other inventory troops to help her out. Thanks Claire. 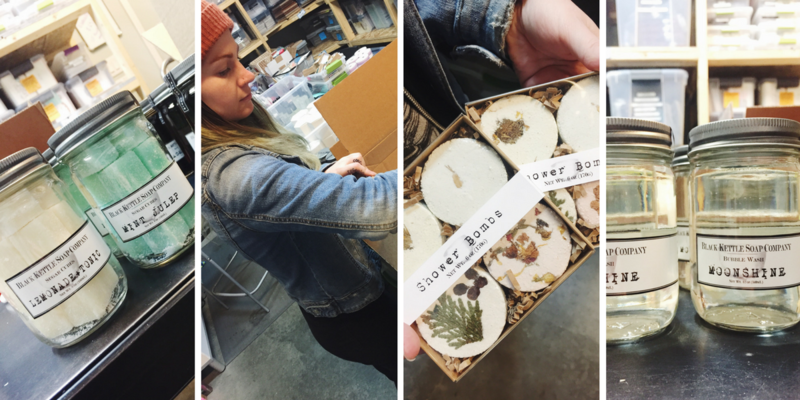 Here’s MK unpacking a brand new order from brand new vendor, Black Kettle Soap Co. There’s moonshine shower wash, shower bombs, and Lemonade + Tonic sugar scrub cubes. We are all so excited! Thanks for all that you do Megan! Workshop: Knit & Sip at Homespun: Friday Nov. 3rd, 6pm-8pm – drink while you craft! All supplies are included in this beginning knitting class. Get your tickets here. First Friday Holiday Charity Show with Cat Head Press: Friday Nov. 3rd, 6pm-8:30pm. 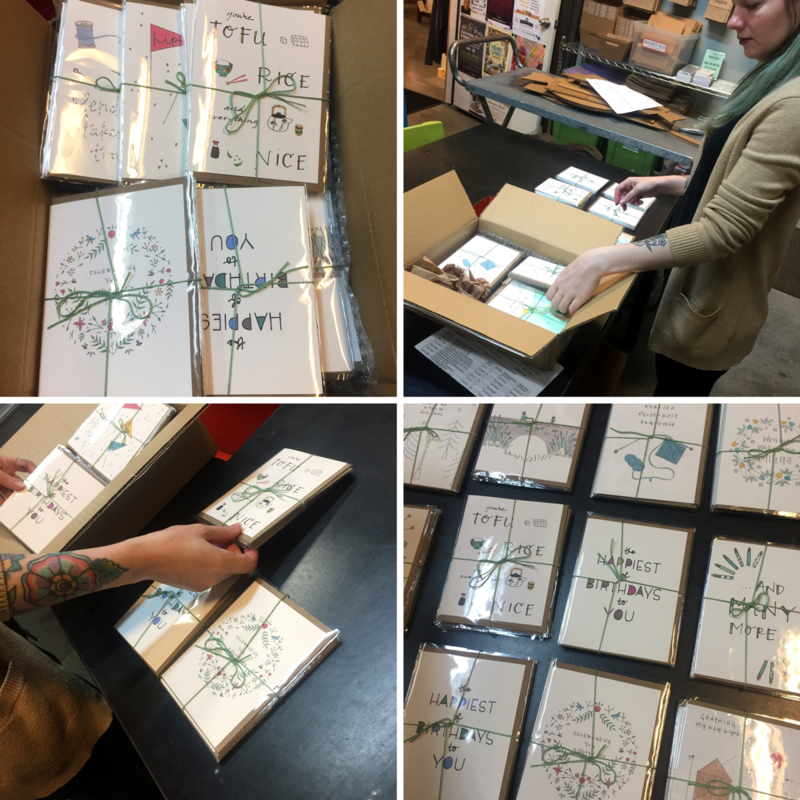 The artists of Cat Head Press have graciously donated prints for this charity gallery show, where 100% of the proceeds will benefit Project Home Indy and Coburn Place Safe Haven. Learn more about the event here. Candle Bar with The Onyx Exchange – Midnight Shopper Edition, Friday Nov. 17th, 6pm-10pm. Mix and match your own scents to create a holiday candle unique to your taste while we’re open until midnight this evening! We’ll also be accepting donations for Project Home Indy and Coburn Place Safe Haven this evening – bring some in and get 10% off your purchase. To learn more about the event and to see a list of needed items, click here. 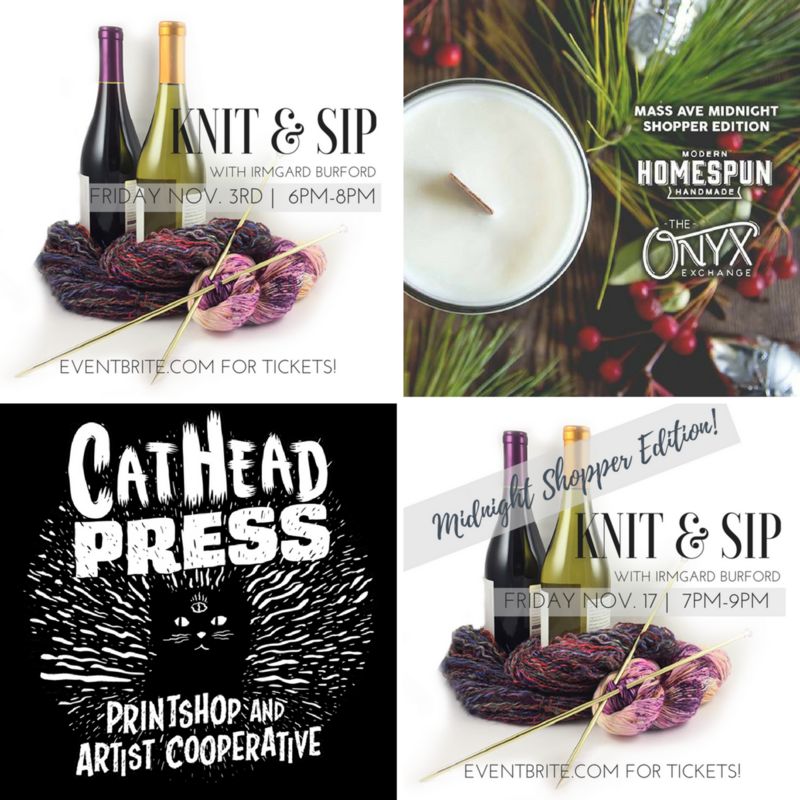 Workshop: Knit & Sip at Homespun – Midnight Shopper Edition: Friday Nov. 17th, 7pm-9pm – drink while you craft during this special late night edition of Knit & Sip! All supplies are included in this beginning knitting class. Get your tickets here! That concludes this week’s ICYMI October 27th! 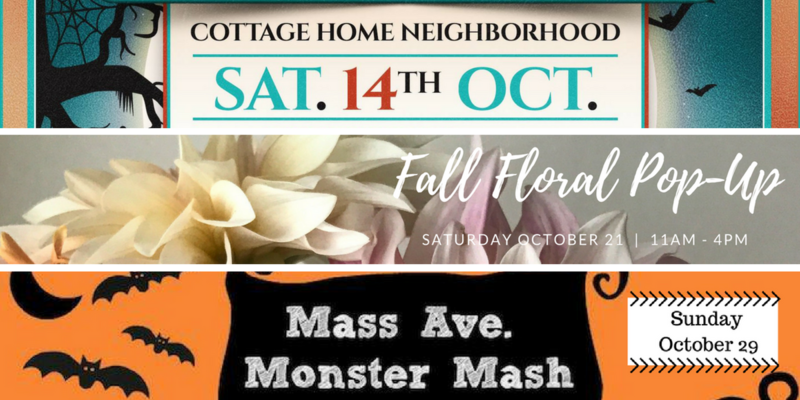 We hope to see you at our upcoming events in October and during Mass Ave Monster Mash on Sunday! Have a happy, handmade weekend! It’s ICYMI time for October 20th! With only 2 more weeks left in October, we are stocking our shelves to the brim with new product for the holiday season! Brand new vendor, Tularoo Soaps, creates bubbly works of art like the cactus soap above. Their ingredients are all natural and they only use sulfate-free, non-comedogenic bases for their soaps. And bringing it full circle, all the packaging is recyclable as well. You won’t find a more perfect stocking stuffer than the Beastie Boys koozie from Jolly Good Designs. -Enjoyable anytime of day. 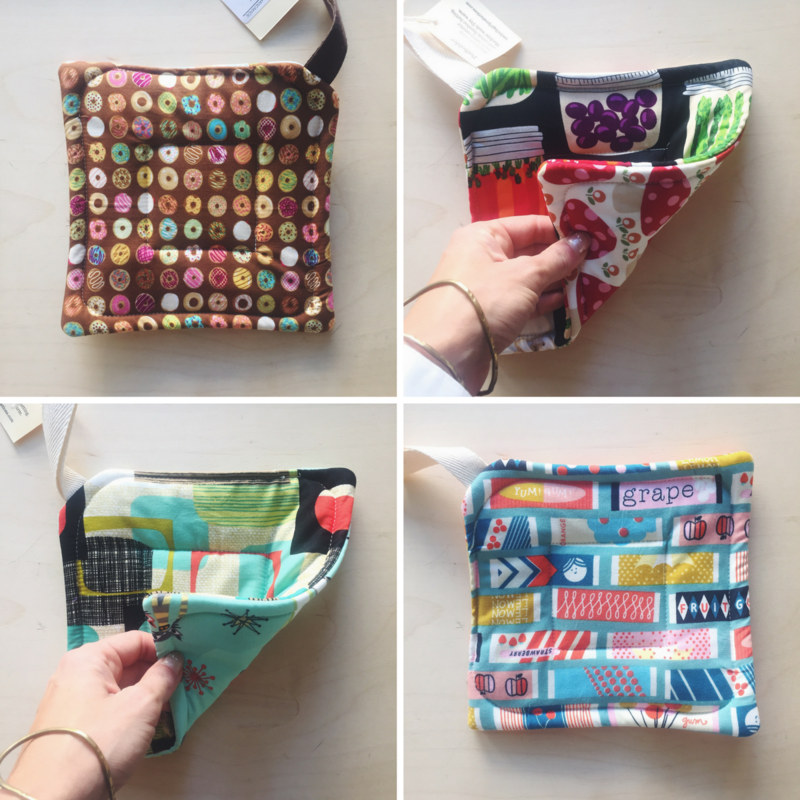 We’ve been restocked on reversible printed pot holders from Umbrella Girls and when bundled together, they make a great gift for the crafty cook in your life. The almond butter sample packs from Revival Food Co. are back, and they are definitely a treat for this fall season. You can gift them all as is, or separate into smaller gifts. -So perfect! 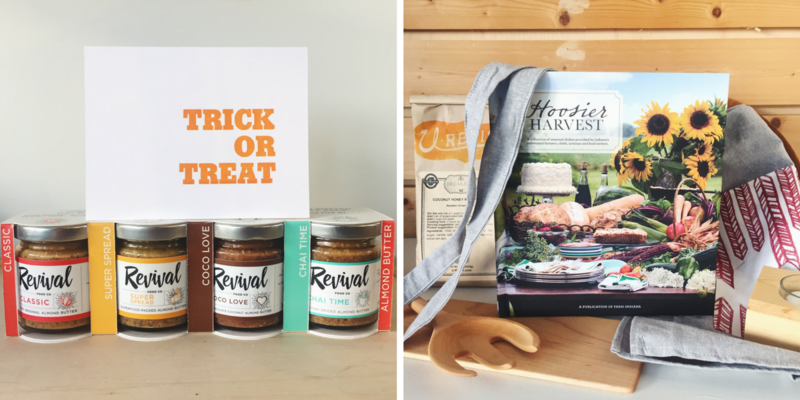 And we can’t talk kitchen without mentioning our Hoosier Harvest cookbook restock from Farm Indiana. This book is full of recipes from Indiana Chefs, farmers, food critics, artisans, and more! 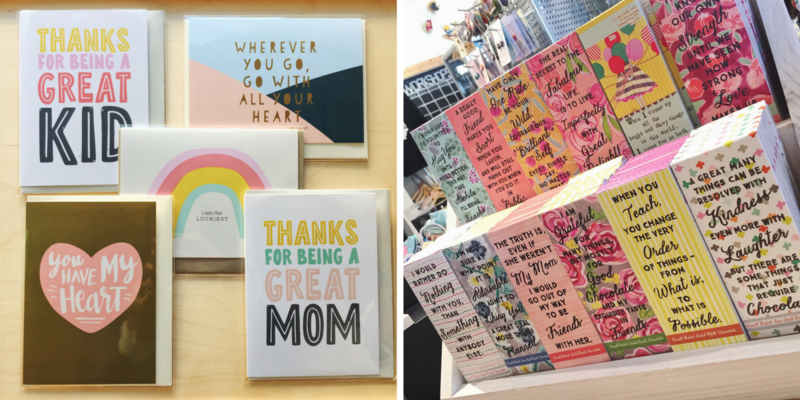 We just received the biggest restock on cards from Haven Paperie and the photo above is just a sampling of some of her new designs. That “Thanks for being a great kid” card nearly had me in tears. So cute. And look at that color scheme she’s using. A+! What’s better than chocolate? How about chocolate that comes in a cute box with a cute saying ready to give to your cute friend? That’s right, those ever so popular chocolates from Curly Girl Designs are back! 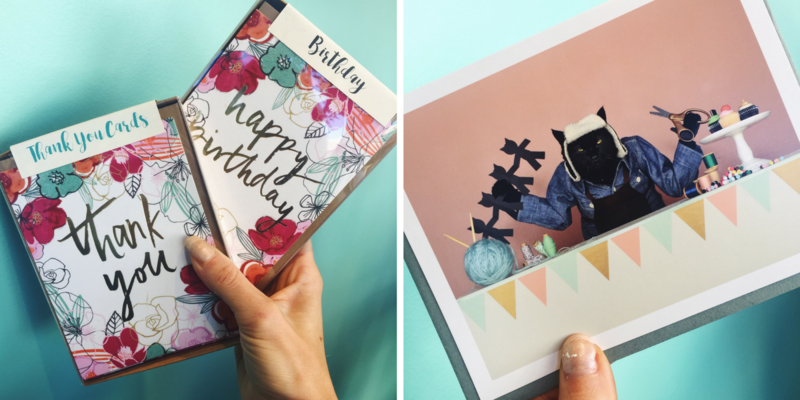 Great things come in small packages… like the new thank you and happy birthday card sets from Big Wheel Press. And AC the Cat is trying out his paws at some crafty business below. That’s totally how I look when I start projects too. Well done, again, Kate Funk. Have a little Stormtrooper, Pikachu, or Ninja Turtle on your hands for Halloween? 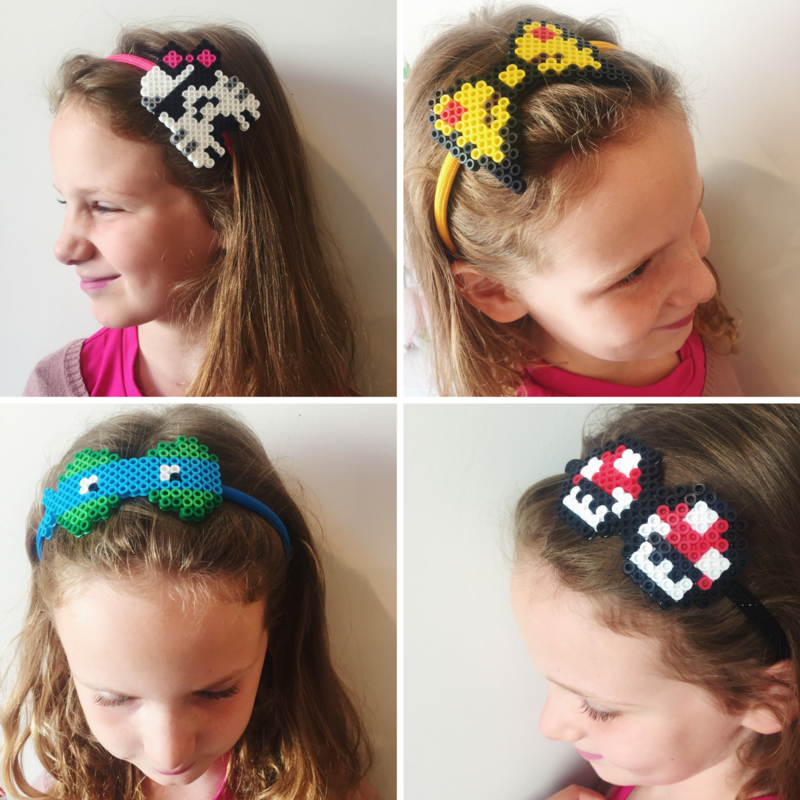 Accessorize their costumes with headbands from Perler Tricks. You can find more in store -and earrings, pins, and framed art made with these throwback beads as well! The kids can add some Halloween flare without breaking the school uniform rules with skull hairpins and necklaces from Rachel O’s and Jean Elise Toys. Sip some spiked cider out of a skull mug from local ceramicist Corey Jefferson. And you can’t forget to send Happy Halloween cards to the nieces and nephews across the state. -Boo cards courtesy of Haven Paperie. Take some inspiration from our display shelves for your spooky soirees this season! You can find haunting prints and posters, dark decor, and other ideas from us in store! 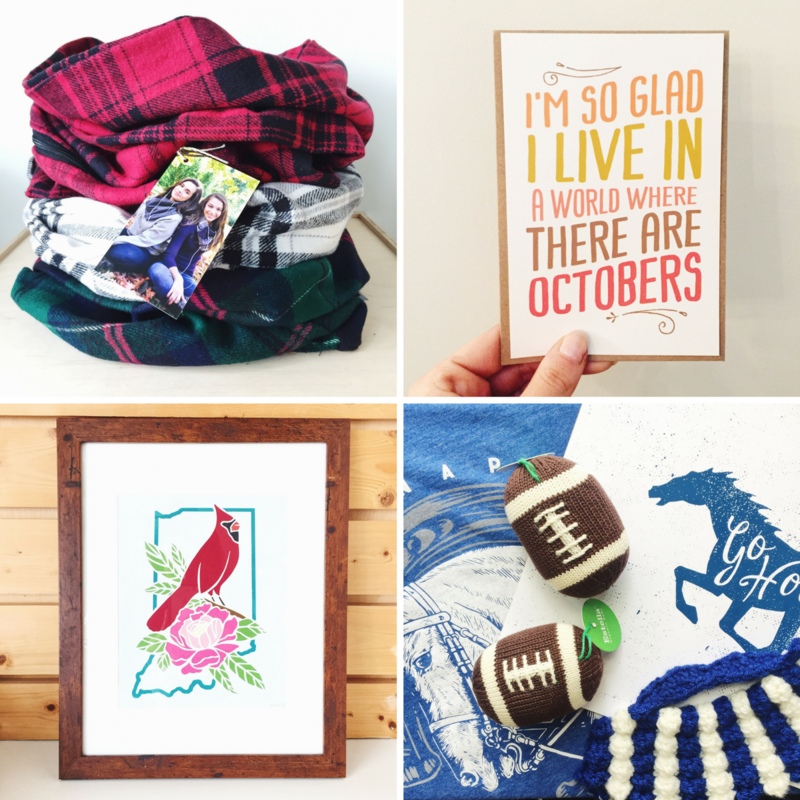 Haley B., our newest employee, is bringin’ you a few of her favorite things this week! A recent Indy transplant, she’s loving all the Midwest charm and she thinks that Indiana Peonies shirt from Yonder Clothing Co. is super charming too. 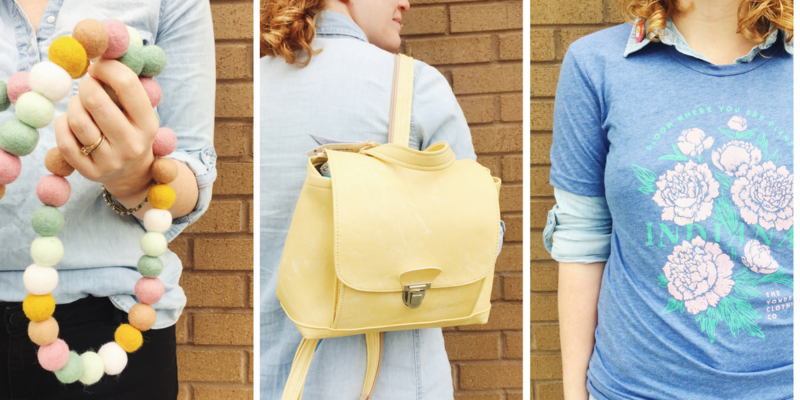 Hayley also has a prominent appreciation for pastel -hence her choice of Goldendrop Garland and vegan pleather backpack from MH Leathergoods. Welcome to the team Haley – you’re killin’ it on the Sales Floor already! 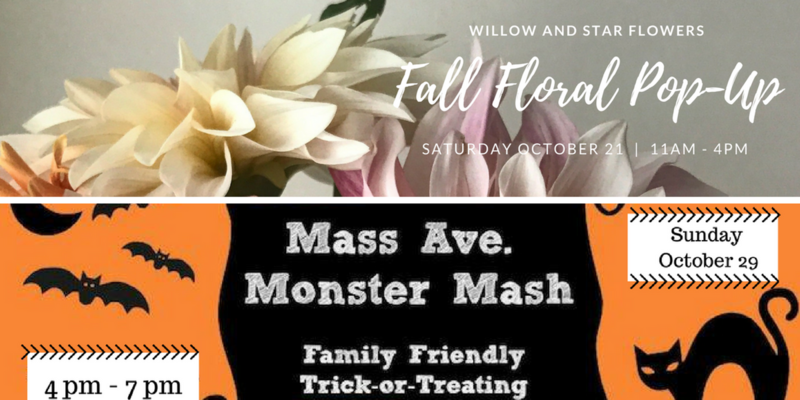 Fall Floral Pop-Up with Willow and Star Flowers, Saturday, October 21, 2017, 11am-4pm. Stop in our store for a fall inspired pop-up flower market. Buy a few stems or put together a whole bouquet and help spread the happiness this fall! Find out more about Willow and Star Flowers here. Mass Ave Monster Mash, Sunday, October 29, 2017, 4pm-7pm. Join us for family-friendly trick-or-treating all along Mass Ave. Businesses up and down the avenue will be handing out treats (some candy and non-candy). This event is FREE – just look for businesses displaying the orange Monster Mash signs between the 300 and 900 blocks of Mass Ave.
That concludes this week’s ICYMI October 20th edition! I hope to see you out tomorrow for our Fall Floral Pop-Up in store from 11am-4pm! Have a happy, handmade weekend everyone! 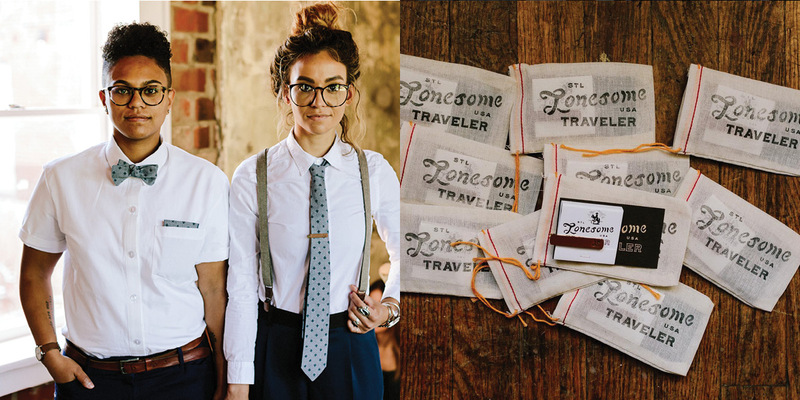 Although Jenny Hill’s business Lonesome Traveler is run by her alone, it radiates the most loving sense of community. Just browse her Instagram and you’ll quickly find hurricane relief efforts, babies, weddings, representation of all peoples, and on top of that beauty- gorgeous neckties. Not just neckties; bow ties, pocket squares, western bows, cuff-links and tie bars, and kid’s bow ties too. Made for ladies and gentleman, this exquisite line of accessories will draw you in for all the right reasons. 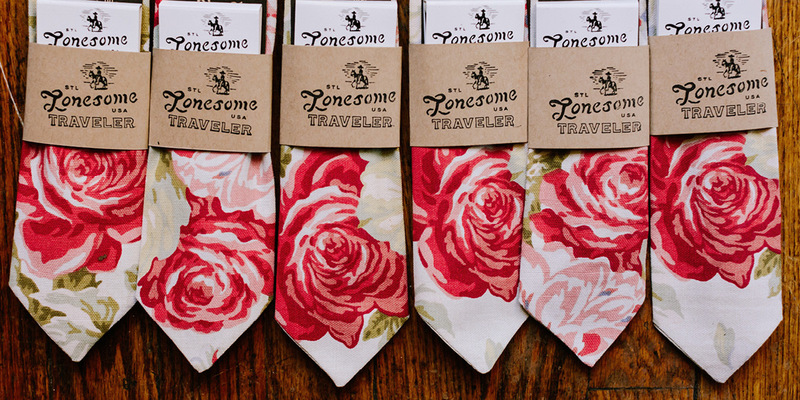 Lonesome Traveler neck-ware accessories are sewn by me, Jenny Hill, in St. Louis, MO. 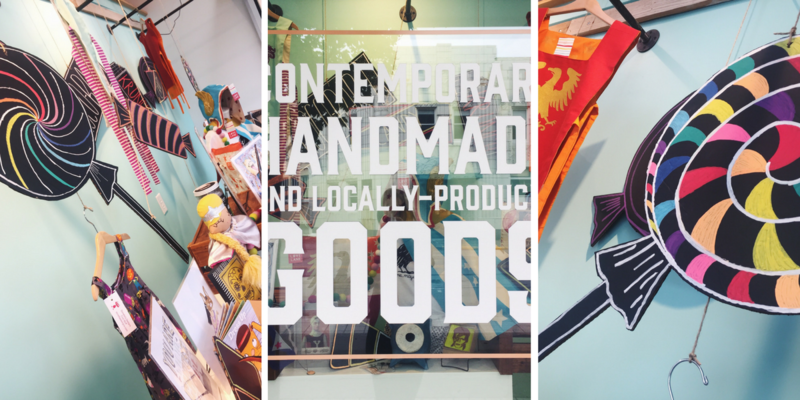 Our goods are created using a collection of vintage, re-purposed, dead-stock and unique found fabrics. All of our neckties, bow ties, pocket squares and women’s western bows are constructed from templates and patterns we develop in-house. We use natural fabrics exclusively, either linen or cotton, and we strive to use fabrics that are either made in the US and/or are recycled vintage. We offer a standard line as well as custom grooms ties for weddings. I make things because as an artist my brain is always designing and creating, I assume most every artist feels that way. I make things for a living because I worked corporate design jobs in my 20’s and when I hit my 30’s I wanted to find a route where I could work more with my hands (and less with computers) and at the same time be my own boss. I knew I wanted to start a family and wanted to be able to work for myself with the ability to design my own hours and lifestyle. 3| What kind of aesthetic do you shoot for when choosing fabrics? When I am hunting for fabrics, certain styles and patterns just jump out at me, and I try to listen to my gut. I work with a lot of vintage, dead-stock, or other unique fabrics that have that vintage inspired feel. I love big, bold florals, unexpected color combos and retro geometrics. Each season I add new styles and this summer I am introducing more limited edition vintage styles. 4| What is it you love about menswear? I have always loved menswear. When I was younger, I was obsessed with Gene Kelly and Fred Astaire, and more so how they dressed than how they danced. I love that menswear has rules and guidelines, which, of course, are made to be broken. I also am a huge fan of women wearing menswear. About half my clients these days are women, both in every day wear and brides who choose to wear suits for their weddings. 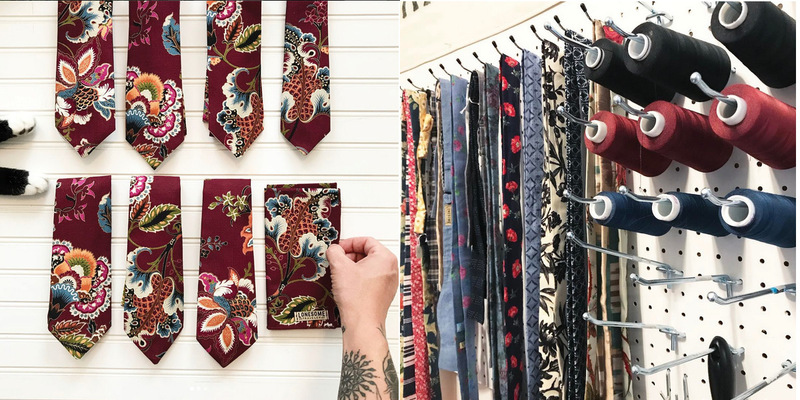 I love connecting with clients who not only appreciate the neckties themselves, but also appreciate the fact that I make them! 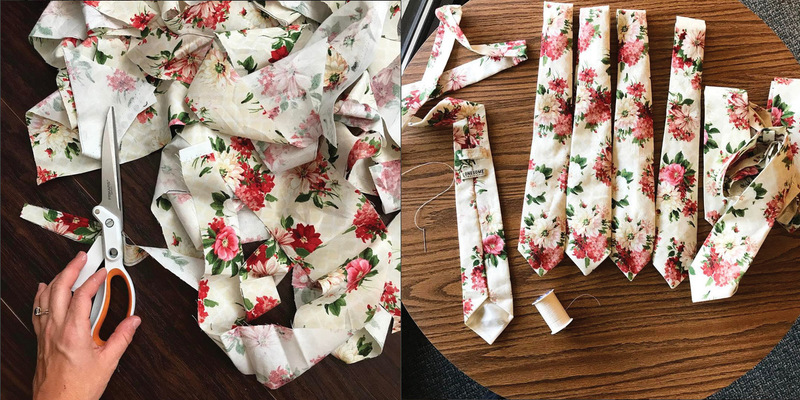 My absolute biggest joy is making neckties for weddings, knowing that I am part of someone’s most magical outfit on their special day. 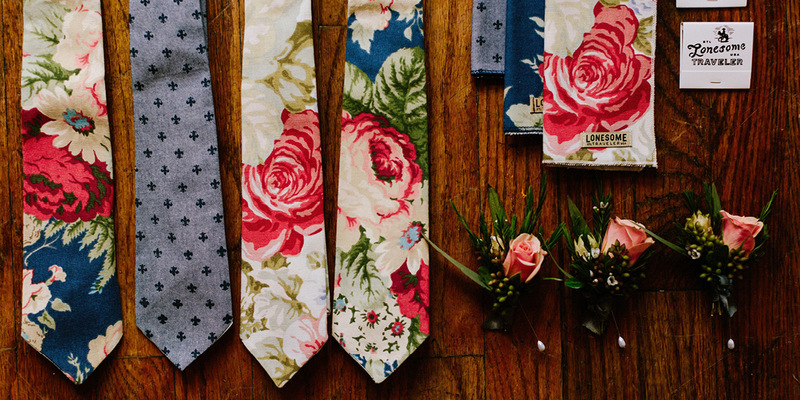 I also love the process of working with brides and grooms to create the perfect tie for their wedding group. 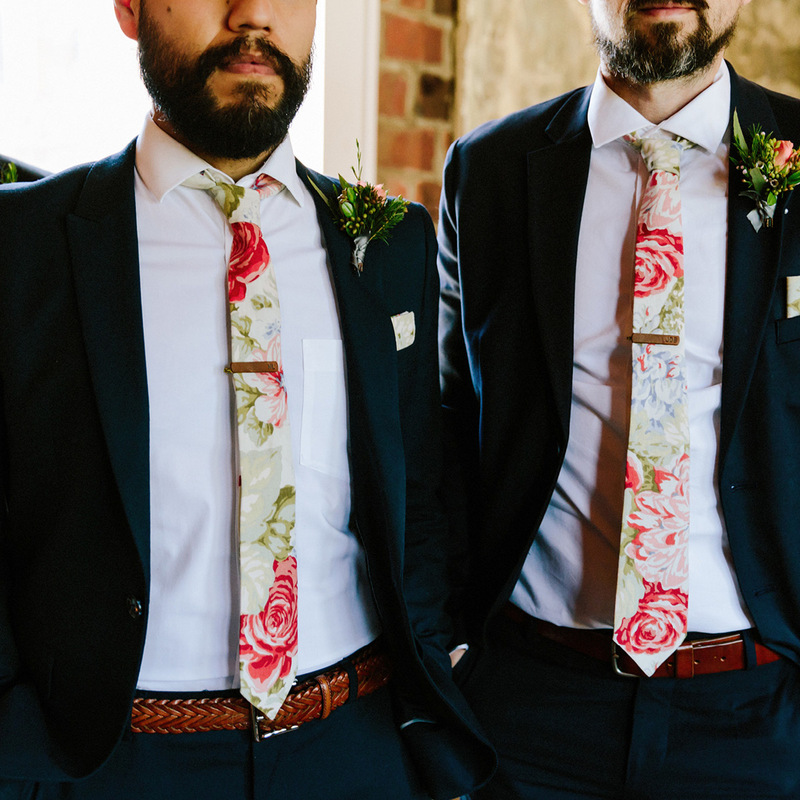 Nothing is more exciting than receiving an email with wedding photos featuring my ties on the groom and groomsmen. I had a very well planned out “aha” moment. Lonesome Traveler was a thought out business plan, not something that just grew organically. I came up with a plan to make neckties before I left my corporate job so that I could have a lifestyle where I could create and be my own boss. I love to sew and am always drawn to men’s fashion, so it seemed like a logical fit! Luckily for me, there was a space open for me in the market and it took off from there! I work in my home studio in St Louis, MO. It is a home built around 1900 with glorious sunlight, which is great for taking product photos. I use a 1970’s Kenmore sewing machine, a 1930’s White sewing machine, and a 1980’s Elna serger. I work with my baby boy Hugo swaddled to me, or while he naps, and when he goes down at night. 8| How did you tackle branding (I’m obsessed with your logo)? When it comes to branding, I found a graphic designer who is an amazing artist, and who shares my same vision for Lonesome Traveler. Mary Frances Foster, who is also out of St Louis, created my logo, which really captures the rustic and vintage Americana feel of my pattern selection. I would love to swap lives with Nikki Lane for about 2 weeks, maybe do a short tour for her. I have all the visual talents but no musical talent. Her voice is so beautiful and unique, and she knows how to kick back and have a good time. Ride around the country and play music with my love… doesn’t seem like a bad life to be living. A handmade object is valuable because of the process that goes into it. The passion and thought and time that goes into each piece, which for us artists often means late nights, pots of coffee and endless podcasts to get orders done. Specifically for the weddings I do, the love comes in the collaboration with the groom, or the bride if she is wearing a tie, and the story that that process tells. It truly melts my heart to see how excited the grooms get to pick out fabric for their big day. My favorite pieces of art that I own (if you can call them an object) are my tattoos. For the most part they are designed by my tattooer Josh Howard. Josh is a classically trained artist and an old school tattooer. He always works with me to turn my concepts into images more beautiful than I could ever imagine. His process of drawing and tattooing, plus my process of pain and healing really make these pieces the most valuable artwork I treasure most. You can see pictures of my tattoos on my Instagram, they always make their appearance in product shots. People are always surprised that I am a practicing Jew. I am covered in tattoos and, for some reason, I guess I don’t look like what people would expect a Jewish woman to look like, but I go to temple at least once a week. I am member of an amazingly progressive temple in St. Louis, and our Rabbi do a lot of work with the Black Lives Matter movement, LGBTQ awareness, and Muslim American inclusivity. This is my other community, outside of the crafting world. -I have lived in 5 cities; Chicago, Los Angeles, Madison, Dallas and St Louis. Most all of these moves were just for fun. -I absolutely love to swim. I swam though my whole pregnancy up to the day my baby boy was born, about 10 hours before I went into labor, and got him into the pool when he hit 2 months. He is almost 4 months now and loves the water as much as I do. He is quite the hit at the indoor YMCA pool. We cannot wait for summer! -I see a friend every day. If I have no plans, I take my boy Hugo to the coffee shop to see our friends who work there. A day without friends doesn’t really count in my book. Love Lonesome Traveler? Come shop her work right here on Mass. 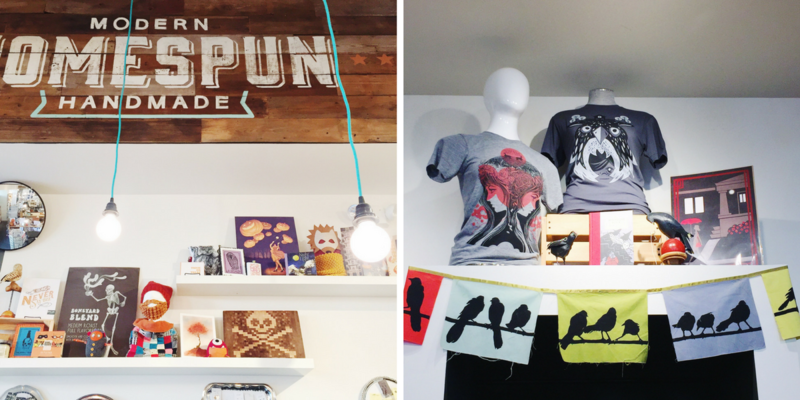 Ave. at Homespun! Or, take a look at her website, Instagram @lonesome_traveler, or Facebook. Thanks Jenny! It’s ICYMI time – Friday the 13th edition! (Cue scary music). So, of course, I’m going to immediately start talking Halloween. Check out our bevy of Halloween costume ideas for the little ones. You can find everything from felt masks and tails from Opposite of Far, to superhero and knight shields from Lovelane Designs. 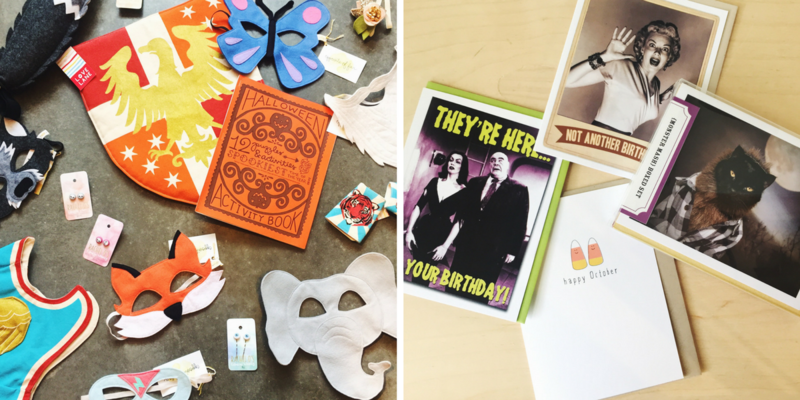 You can’t forget about a Halloween card, or a card for that lucky person that just so happens to have an October birthday. Spooky selections available from Alternate Histories. And on the sweeter side of Halloween, you can find candy corn cards from Haven Paperie. 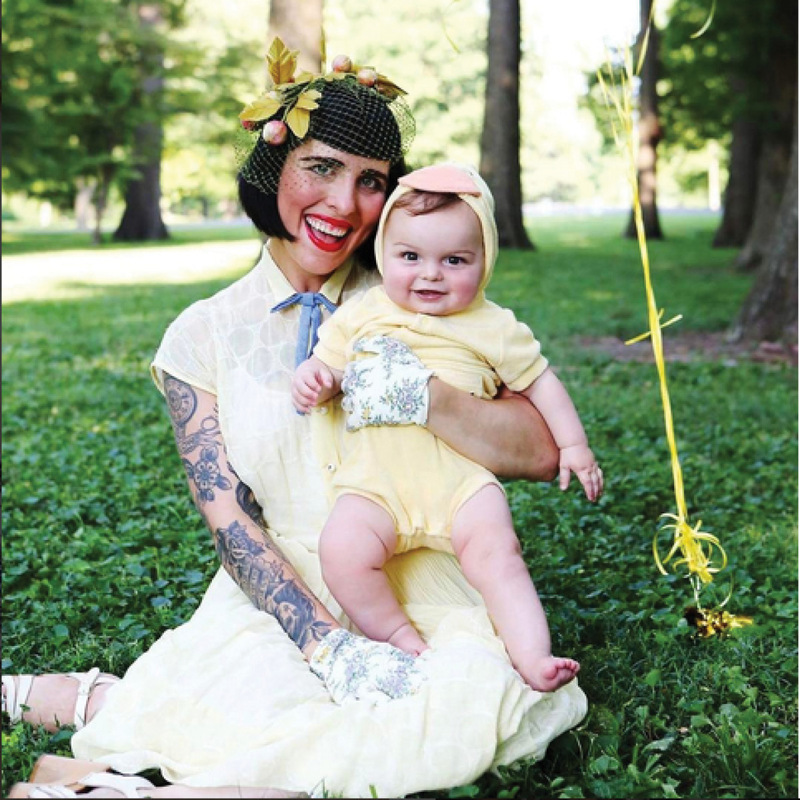 Parents, you really have no excuse not to dress up. 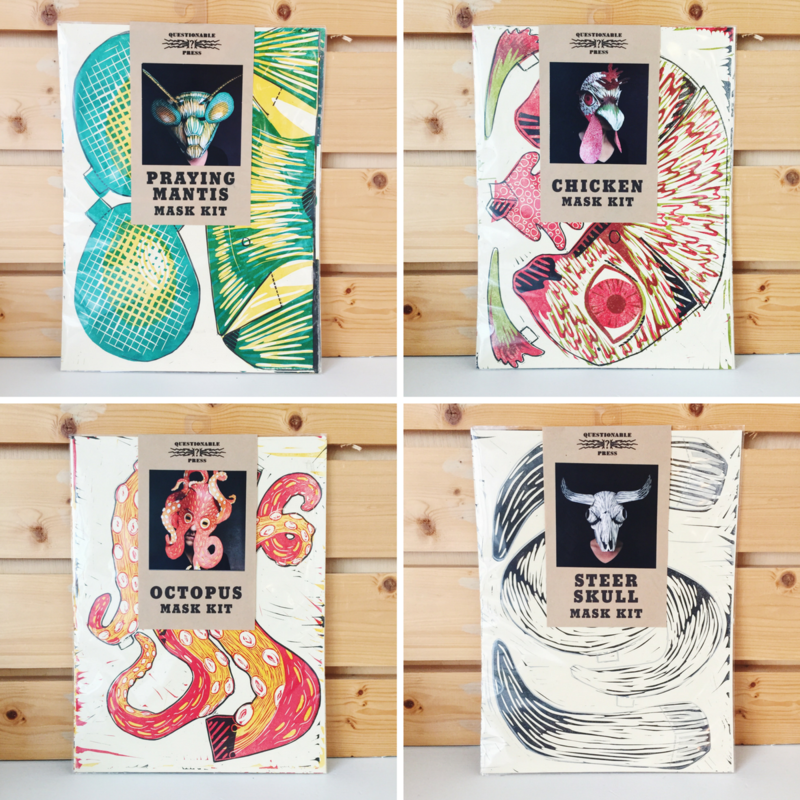 Questionable Press has made it so easy for you with these woodcut mask kits! More designs are available in store. And I promise, they’re easy to put together (unlike all those things you probably just bought at IKEA). AC is back with a brand new edition. -Of cat calendars that is. 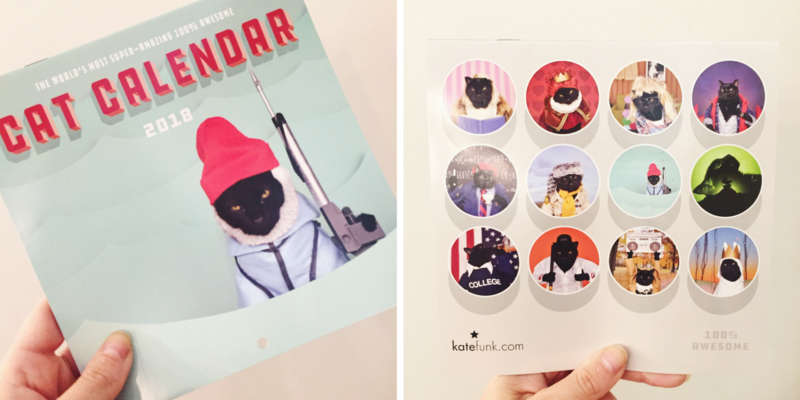 Kate Funk has done it again, dressing up her main squeeze, AC the cat, in costumes to keep you gigglin’ all year long. You know we love to bring you the local! 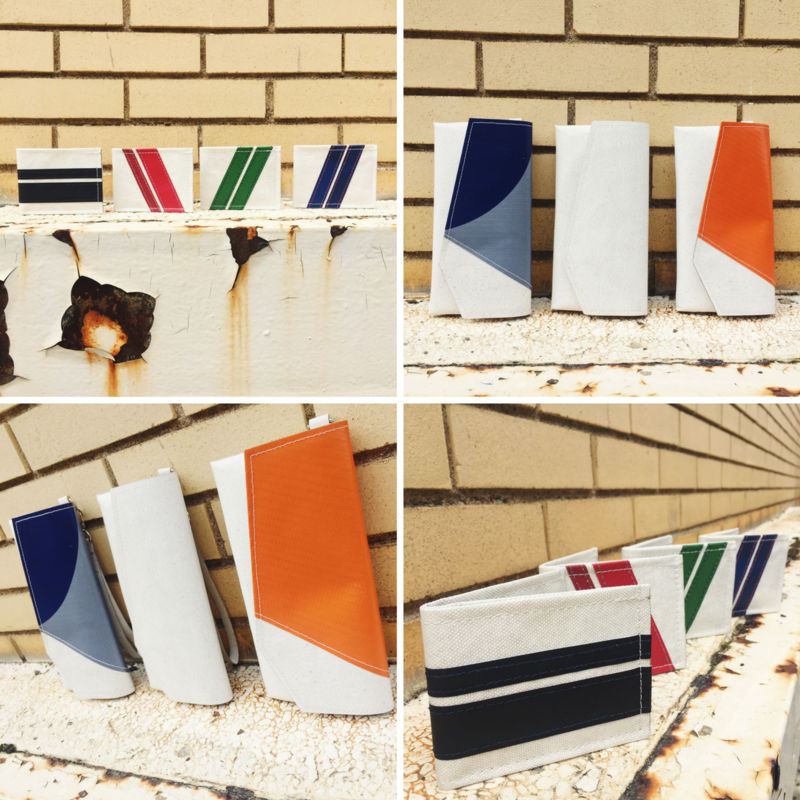 Pocket scarves from Specifically Random are perfect for the on-the-go college or high school student. -The scarves hold your phone and have a place for your earbuds cord. -Easy listening! Of course Haven Paperie made that Octobers card above. -And it’s probably one of my favorite cards right now. 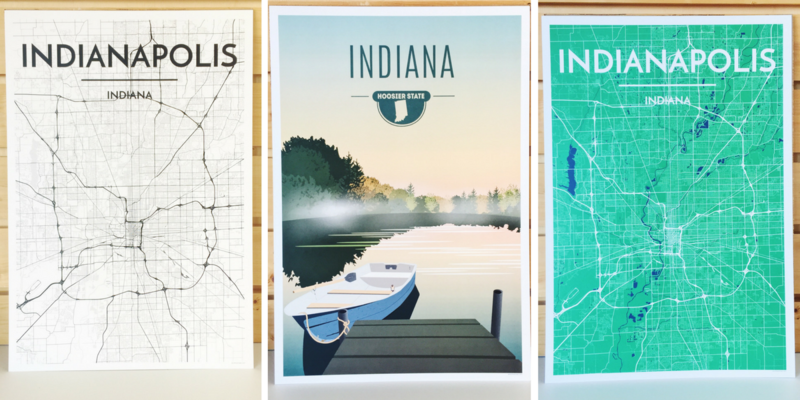 We’ve also been restocked with paper cut Indiana art from Geez Louise Designs. Since sport ball season is upon us, we thought we’d show you some of the “blue and white” flare we have in store -for the grown ups and kiddos alike. 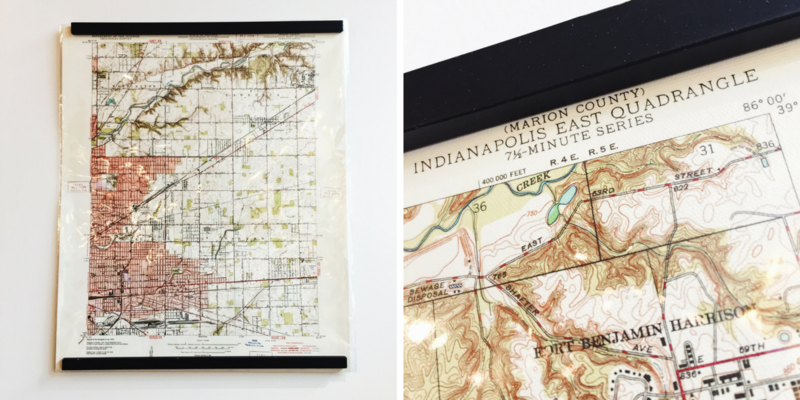 And below, check out the vintage canvas map of Indianapolis from Cuyahoga Collective, framed perfectly with STiiCKS, magnetic poster frames from Well Made. It’s the perfect gift for that person wanting to make a subtle shout out to Indy on their wall. 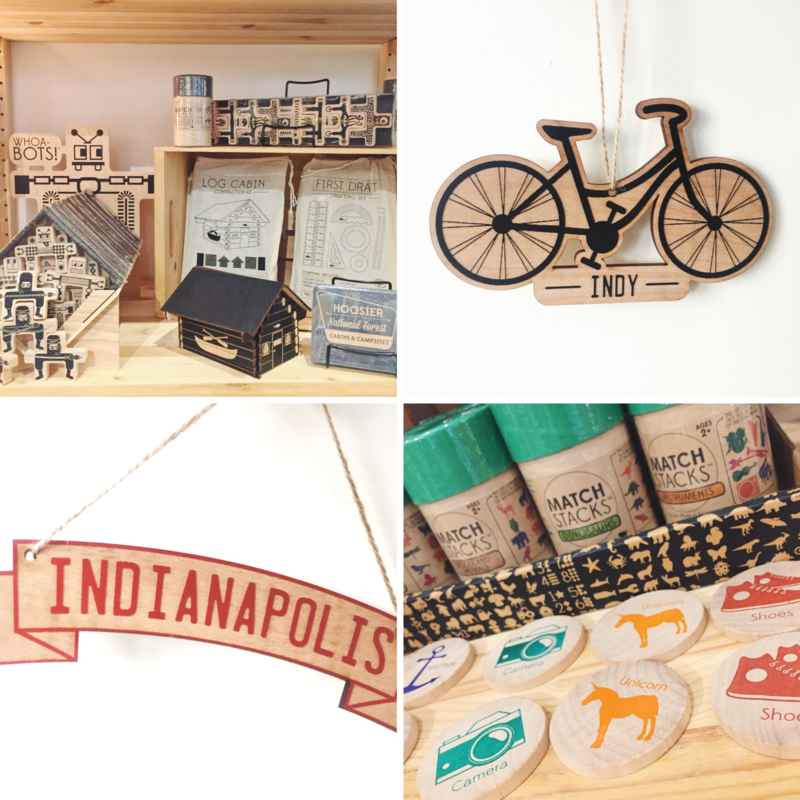 It’s never been so easy to give the gift of Hoosier handmade! Who knew bicycle inner tubes could look so good? We did. 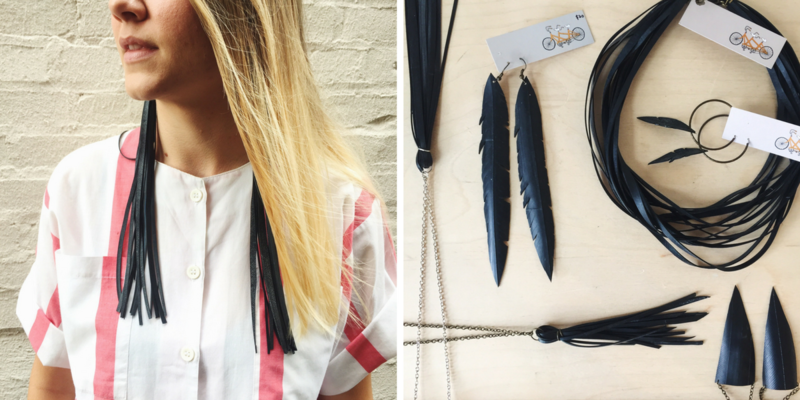 That’s Lee, our How-To and Meet Your Maker Blogger, reppin’ the long fringe earrings from True Partners in Craft. TPIC uses recycled bicycle materials to create this edgy line and we are absolutely on board with it. Megan took a little break from her crazy, busy job as our Inventory Manager to pose for me with some of her favorite products. A past (but still kinda present) alt rocker, MK loves her plaid and that new pocket scarf can keep Megan close to her music (or podcast) on her phone. She loves adventuring and hiking into the uncharted Midwest with her boyfriend. -Which is why she’ll be hanging that Tree Hopper Toys adventure print in her living room. Megan is also the type of girl who can throw on some lipstick and call it a day. -That’s me saying that, not her. But it’s true and I’m jealous of her single-step morning routine. MK is in love with our Aromi matte lipstick and pretty much every color looks good on her. Now you’re jealous too. I know. We can’t all be like Megan. Cottage Home Block Party, Saturday, October 14, 2017, 5pm-11pm. Come join us for the best Halloween party of the season in the Cottage Home Neighborhood! You’ll find activities, food trucks, libations, and vendors – like us! Be sure to find our booth! That concludes this week’s ICYMI October 13th edition! Stay safe on this Friday the 13th and we hope to see you out tomorrow at the Cottage Home Block Party! Have a happy, handmade weekend! 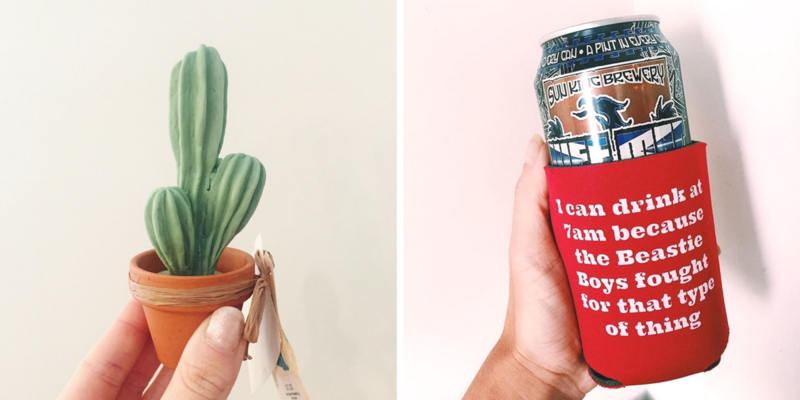 It’s ICYMI October 6th edition! And hello, October! 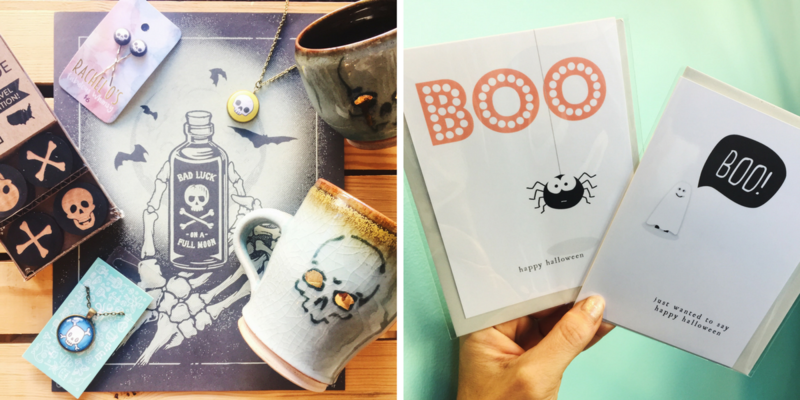 Bring on the darker colors, new bags, boots, sweaters, and of course – Halloween decorations! Fall is also the perfect time to go camping, and luckily we have this awesome restock from People for Urban Progress in store! Those dopp kits will nicely hold all of my camping toiletries and then I can go back to being a boss lady at work with my Executive tote bag (fits a laptop perfectly)! And we don’t just have dopp kits and tote bags in store. PUP has given us the crème de la crème of restocks. 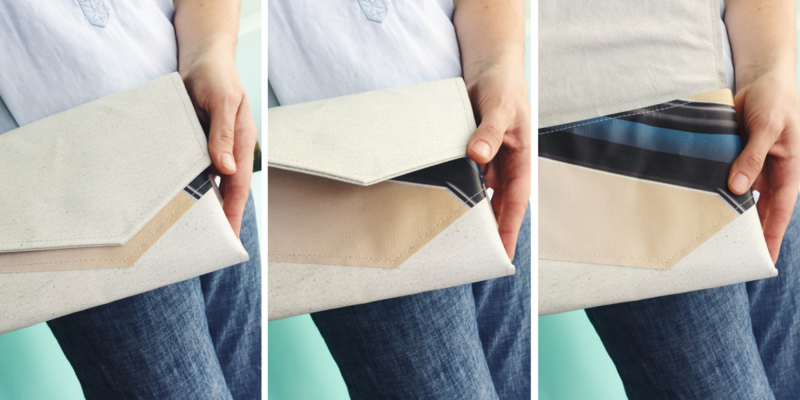 You’ll find clutches, wallets, iPad covers, and more. 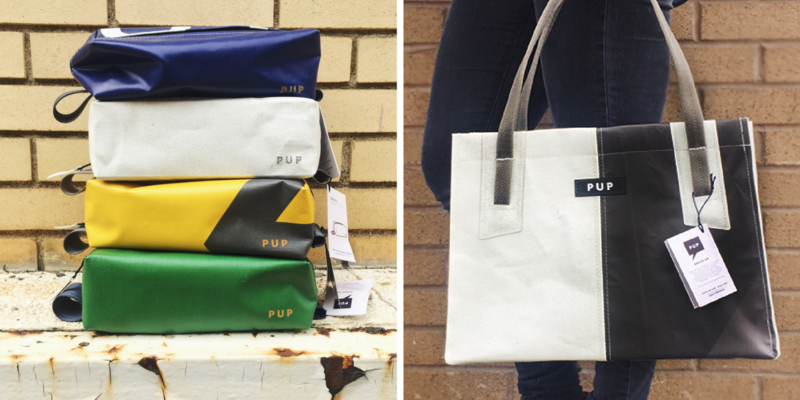 Using reclaimed materials like Super Bowl Banners, RCA Dome ceiling fabric, and seat belts from abandoned vehicles, PUP repurposes fabric that would otherwise be taking up space in a landfill. These really are goods for good. Tree Hopper Toys keeps delivering in the cuteness department! Remember those Lincoln Logs you played with in the 90’s? Well now your kiddos or grandkiddos get the updated version! -They can even put a little Hoosier National Forest sign outside of their cabin! And I know we’re talking fall and Halloween, but, yes, we do already have Christmas ornaments out on our shelves. We’re not really sorry, because those Indy ornaments are just awesome and so well made. Since I’ve already brought up Christmas, I recommend stuffing a few Match Stacks games into the wee one’s stockings. -There’s even a Hipster version! MK takes her card ordering seriously. You can thank her for these cute new card sets from An Open Sketchbook. 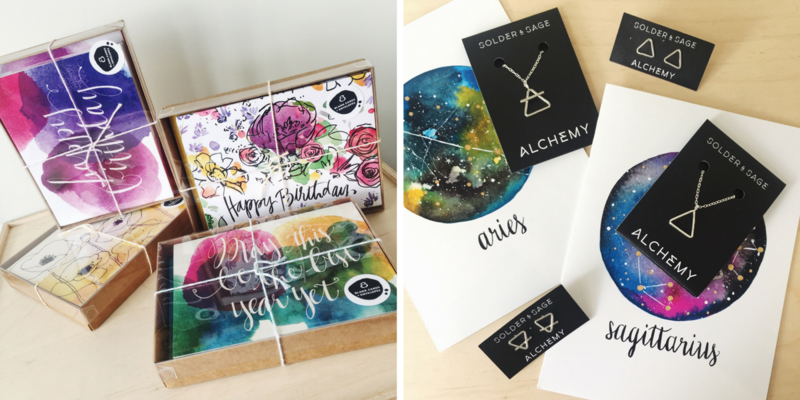 And why not put the best gift together by pairing an astrology card from A Quartzy Life with new alchemy jewelry from Solder & Sage. Look what Megan did for you! 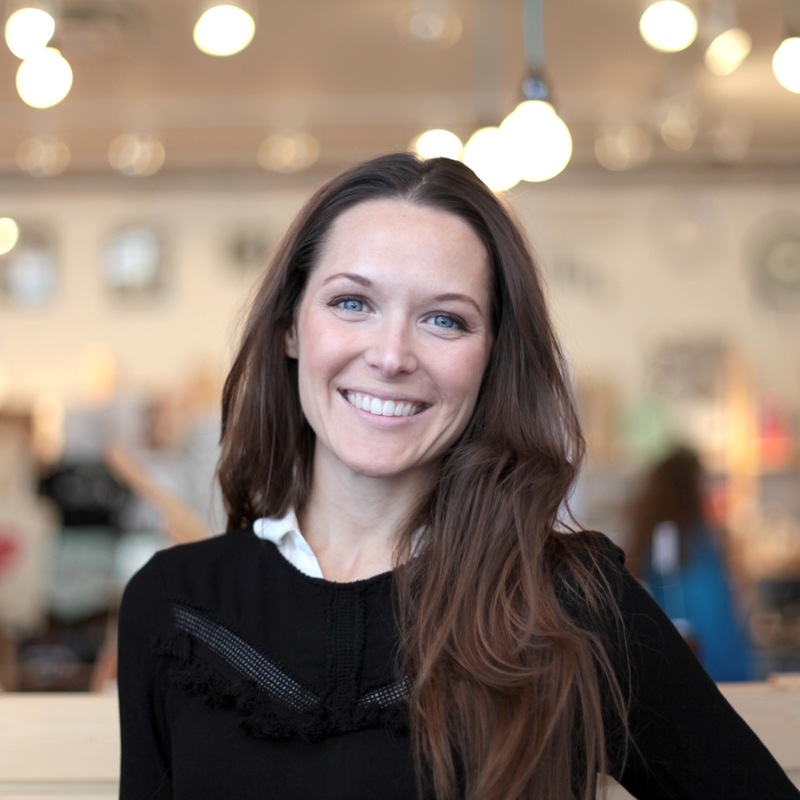 If you’ve ever been into our store and had the pleasure of meeting Claire, you probably fell in love with her instantly. Just like I did. This magical women shared some of her favorite products with me this week and you’ll probably love them too. 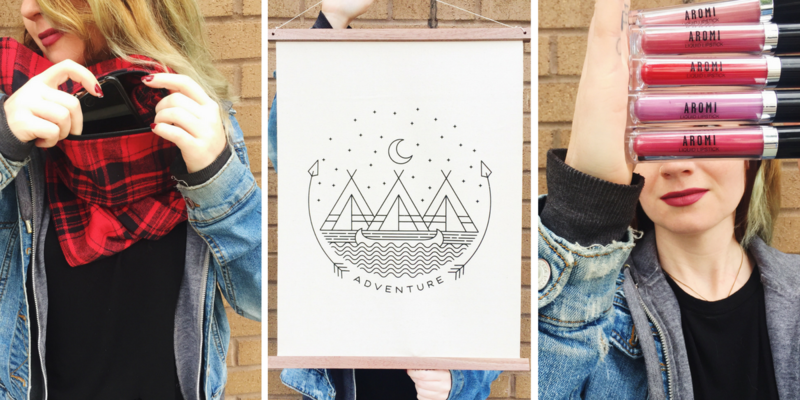 Often drawing mandalas in her spare time, Claire loves symmetry, which is why that wall hanging from Andria Green speaks to her. Cozy. Coffee. Claire. -Her catch-phrase if she had one, and that pour-over from Sarahmics fits right in. Following a recent cross-country RV trip, Claire wants to one day have mountains outside her bedroom window (print by Laura Berger). Me too, Claire. Me too. Most definitely my favorite holiday, our Halloween window displays are always my favorite to design. And this year I went with a kiddo-candy-bonanza theme, and I love it. We have handmade costumes, felt masks, Halloween dresses, and more in store for all your spooky needs! Thanks to all the crafty, artsy teammates that helped me complete this display, as well. You guys are so SWEET. -Get it? First Friday featuring CFI 2 Art Club, Friday, October 6, 2017, 6pm-8pm. The students of Art Club have decided to donate 100% of the proceeds from their projects sold to non-profit agencies. More information about the event here. That concludes this week’s ICYMI October 6th! Keep following us on all our social platforms (Instagram, Facebook, Twitter, Pinterest) and have a happy, handmade weekend!